I mentioned in an earlier post that I like to cook up large amounts of meat and freeze meal-size portions for later use. Here's how I do chicken -- I have the "Barefoot Contessa" Ina Garten from the Food Network to thank for this recipe. You save money by using the bone-in, skin-on chicken breasts and the meat is more flavorful. Preheat the oven to 350 degrees. Place the chicken breasts on a baking sheet and rub them with olive oil. Sprinkle generously with salt and pepper. Roast for 35 to 40 minutes, or until cooked through. Set aside until cool enough to handle, then remove the meat from the bones and discard the skin. Cut the chicken into large dice or shred. You will have 4 to 6 cups of chicken. Divide into amounts you will need for meals, wrap and freeze. When ready to use frozen chicken, thaw in refrigerator for 24 hours for best results. This recipe from Everyday Food magazine is currently cooking away in my slow cooker. It was a snap to throw together -- it only took a few minutes. The country-style ribs I used were frozen solid, so I'm planning to adjust the cooking time just a little to compensate for that. This is such a cheap meal! I got the ribs on sale back in July for 99 cents a pound, and I'm going to get two family meals (plus leftovers) out of this! This looks like a great way to make French toast without dirtying a ton of dishes every time you get a craving. Instead, make one big batch, freeze it and heat pieces when you like. A toaster oven would make this even easier! I wish I had a toaster oven, but -- alas! -- no counter space! The recipe is adapted from the Freezer Supper Swappers. 13-in. x 9-in. x 2-in. baking dish. Pour egg mixture over bread. Let soak for several minutes, turning once to coat. Freeze until firm. Package in Ziploc bags. To bake, place bread on a well-greased baking sheet. Dot with margarine. Bake at 450° for 7 minutes; turn and bake 10-12 minutes longer or until golden brown. It's apple season around here, and I'm constantly looking for new recipes that utilize the fruit. I've got a huge box of apples sitting in my basement, thanks to my grandparents' overflowing tree. My friend Laura passed on this recipe to me. She found the original recipe (from the Associate Press) in the newspaper. It looks fabulous! Can't wait to try it. Thanks, Laura! Heat the oven to 375 degrees. Lightly coat a baking sheet with cooking spray. On a lightly floured counter, divide the dough in two. Use a rolling pin to roll out each piece of dough into a 10-inch circle about ¼-inch thick. Transfer the crusts to the prepared baking sheet (you may need to use 2 sheets). Set aside. Place the margarine in a small, microwave-safe bowl. Microwave on high until melted. Mix in the cinnamon, cardamom, nutmeg and brown sugar. Use a pastry brush to coat both crusts with some of the margarine mixture; reserve the remaining margarine. Arrange half of the apple slices over each crust, then brush the apples with the remaining margarine. Sprinkle half of the cranberries over each tart. 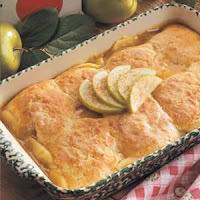 Bake for 25 minutes or until the crust is lightly browned and the apples are tender. Let cool before serving. *** For a nice finish, dust the tart with powdered sugar, or a blend of powdered sugar and cinnamon. *** The dried cranberries can be soaked in water or juice for 15 minutes before using. This isn’t necessary, but it makes them plump and juicy. Be sure to drain them well before placing them on the tarts. ***One recipe of pizza dough is enough for this recipe. My friend Holly does once-a-month cooking -- she has four little girls; once-a-month cooking is a necessity! She recently posted this recipe to her Once a Month Yumminess blog. Not only is the recipe once-a-month cooking, it's also a slow cooker recipe. Super easy! This soup brings back memories from college. My sorority's house cook used to cook this up and serve it in bread bowls. Comfort food at its best! 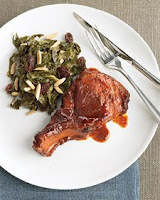 The recipe below was adapted from Sweet Savory Southern. It's simmering away on my stove as I type this. The house smells divine! We've been experiencing some fall-like weather the past few days, so I can't wait to curl up with a bowl of this and some garlic bread. This recipe makes a gigantic batch of soup! Either be prepared to freeze part of it or halve the recipe. If you do freeze the soup, make sure you let it thaw completely in the refrigerator prior to reheating, or the pasta will turn to mush! For a vegetarian version, skip the sausage and add more beans and use vegetable broth instead of beef broth. Heat 1 tablespoon of the oil in a large stockpot over medium high heat, and brown the sausage, crumbling it as it cooks. Once brown, remove sausage from pot with a slotted spoon. In the same pot, add the onion, garlic, carrot, celery and salt, and saute over medium heat until vegetables are soft, about 8 minutes. Add sausage back to the pot and the can of diced tomatoes (do not drain), stir briefly, and simmer for 10 minutes. Stir in the beans, and add the beef broth and tomato sauce. Add in all of the seasonings, stir well, turn the heat to high and bring the soup to a boil. Once it boils, turn down to low heat, cover, and simmer for at least 30 minutes.